A new partnership between Drexel University’s College of Engineering and the Korean Advanced Institute of Technology will allow students from both schools to participate in research co-op positions. 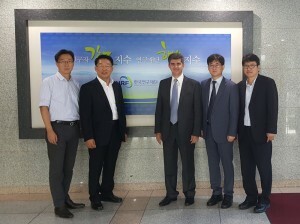 Titled as the “Fusion for Innovation R&D Service and Training Nano-materials-based Nano-fabrication Co-operation & Collaboration Center” or the “FIRST Nano Co-op Center,” the new collaboration will take place via an exchange program between America and Korea. The partnership will utilize the National NanoFab Center on the KAIST campus as well as Drexel research labs such as those run by professors Yury Gogotsi and MinJun Kim, the co-founders of the partnership. The discussions to start this global effort began in November 2014, when Kim brought a delegation from the NNFC to Drexel. In the next few months, faculty members, including Gogotsi, will visit the NNFC to explore opportunities for collaboration. Gogotsi also met with a principal researcher at the NNFC, Chi Won Ahn. Through their meeting, the institutions involved with the planning started to find common ground. “After identifying common research interests and understanding that there is a common interest in creating a unique international co-op program that would serve as an example to follow for other institutions, we started to work on the proposal,” Gogotsi wrote in an email. The proposal that was produced by the Drexel/KAIST team was chosen by the Korean National Research Foundation as one of the top 12 proposals. These 12 proposals were then presented by their respective teams live in Seoul to the KNRF. Four teams, including the Drexel and KAIST team, were chosen for funding. According to Gogotsi, the KNRF proposals introduced heavy competition. “Some of our competitors came from the best known universities in the world. So, the road to success was not easy, but we are delighted to receive funding and create new opportunities for Drexel students,” Gogotsi wrote. That funding amounts to $900,000 per year for up to six years. After the first two years, the program will be re-evaluated by the KNRF, who will then decide whether or not to continue funding. Both institutions will continue to plan what kinds of joint research activities they will be introducing for students both here and in Korea, as well as strengthen the existing exchange program between the schools. Gogotsi expects the program to send and receive the first cohort of exchange students in 2016. The first few years of the program will only involve graduate students in the exchange. “Once the Center is approved for renewal in four years, we will be able to expand the research co-op program to Drexel undergraduate students in STEM fields,” Danielle Kopicko, the associate director of the Nanomaterials Institute at Drexel, said. Kopicko added that she felt the partnership will create a unique and exceptional global program. Korean graduate students from KAIST will be working in the A.J. Drexel Nanomaterials Institute while their American counterparts will be working in the NNFC with KAIST professors and researchers to aid them. “We can make unbelievably small gadgets using instruments available at NNFC and this will provide invaluable experience to Drexel students,” Gogotsi expressed. He also stated that he has hosted Korean students from KAIST in his own research group, and that both students enjoyed their time here, and also published papers on the research they conducted in Gogotsi’s lab. 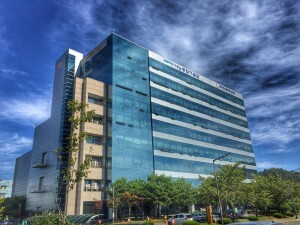 “The fact that KAIST, ranked as [the third best] university in Asia and being one of the best in the world, is interested in sending students to Drexel clearly shows that we perform world-class research in the field of nanomaterials and provide excellent education and training at Drexel,” Gogotsi said. Overall, Gogotsi is hopeful the program will offer students something different. “The ultimate goal is to open the door to the world to Drexel students and offer to them a unique opportunity that they did not have before,” he summarized. Graduate students interested in the program will be selected personally for the first exchange by faculty involved in the creation of the program such as Gogotsi and Kim.